Jeremy O'Day's first foray into CFL free agency as a general manager promises to be a unique one. As of Friday, more than 190 players were scheduled to hit the open market at noon Tuesday. That number could change with teams signing perspective free agents before the deadline, but starting quarterbacks Mike Reilly, Bo Levi Mitchell and Trevor Harris are expected to headline a deep talent pool. With only one quarterback on Saskatchewan's roster, it's a position of priority for O'Day, who was named the Roughriders' vice-president of football operations/GM last month. "It will be interesting to see if everyone makes it to free agency,'' O'Day said. "If they do, it's really going to add a different dynamic because I don't think there's been one like it with the amount of franchise quarterbacks going to free agency. This won't be O'Day's first free-agency experience. 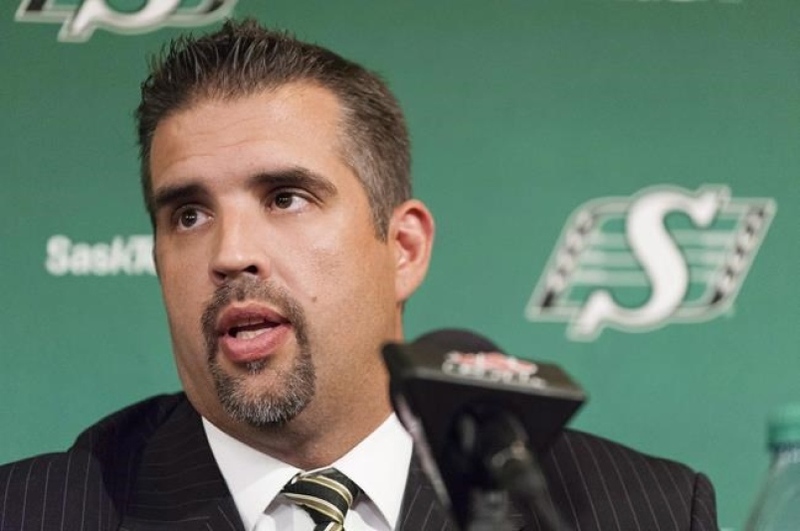 In 2011, he became Saskatchewan's football operations co-ordinator before being named assistant GM a year later. He was appointed vice-president of football operations and administration in December 2015. Toronto Argonauts GM Jim Popp also is a veteran of CFL free agency. But even he can't remember seeing so many players poised to hit the open market. "By sheer numbers, yes, it's different,'' said Popp. "There's a lot of people waiting and wondering what's going on. - Veteran players being allowed to sign one-year deals. Many go this route to not only keep their options open at season's end, but also be better able to cash in quickly following a solid campaign. - The uncertainty regarding the '19 salary cap. That figure was $5.2 million last year but the current CBA is scheduled to expire in May. As well, the league's minimum salary in 2018 was $54,000. - The CFL not allowing players who sign contracts this off-season to collect signing bonuses until after a new CBA is ratified. Essentially, there's no reason to justify signing immediately. - More options outside the CFL. The eight-team American Alliance of Football begins play Saturday while the rejuvenated XFL has started preparing for its 2020 reincarnation. The AAF's standard player contract covers three years and US$250,000 - $70,000, $80,000 and $100,000 - in base salaries with a chance to earn more with bonuses. In the CFL, the quickest fix often comes at quarterback quarterback. Reilly was the league's highest-paid player last year at over $500,000 with the Edmonton Eskimos, but he's expected to set a new benchmark (around $700,000) in free agency. Reilly, 34, hasn't missed a game the last three years and thrown for more than 5,500 yards each season. After guiding Edmonton to a Grey Cup title in 2016, Reilly was the CFL's top player the following season. He has 88 TD passes the past three years. Reilly's timing to hit free agency couldn't be better. Only the Hamilton Tiger-Cats (Jeremiah Masoli) and Winnipeg Blue Bombers (Matt Nichols) have established starters under contract. Reilly will help determine what Mitchell (Calgary Stampeders) and Harris (Ottawa Redblacks) can command on the open market. However, a big challenge for GMs is trying to sign free agents while not knowing what the '19 salary cap will be. Mitchell, 28, has led Calgary to two Grey Cups (2014, 2018) and been named the CFL's top player twice (2016, '18) since becoming the starter in 2014. At age 28, the native of Katy, Texas - who is 69-15-2 as a starter - is definitely in his prime. Mitchell worked out for seven NFL clubs this off-season, but he has not signed a contract. CFL sources say if Mitchell opts to remain in Canada, he's not necessarily a lock to return to Calgary and would explore all of his options. Harris, 32, enjoyed his best CFL season last year, setting career highs in passes tried (615), completed (431) and passing yards (5,116) while leading Ottawa to a Grey Cup berth. "There's obviously the big three who're getting all of the attention,'' O'Day said. "But if you look at the group as a whole, there's a lot of guys who've been starters in our league and been very good players. That second group would include Zach Collaros (Saskatchewan), Travis Lulay and Jonathon Jennings (both B.C. Lions). Kevin Glenn, 39, is a longtime CFL starter who didn't throw a pass last year backing up Reilly while Brandon Bridge, 26, of Mississauga, Ont., started some games the past two seasons with the Riders. - Receivers Derel Walker (28, two-time CFL all-star coming off knee injury) and Greg Ellingson (three straight 1,000-yard seasons with Ottawa) are both up for grabs. - Linebacker Larry Dean (29, 96 tackles, East Division's top defensive player with Hamilton), offensive linemen SirVincent Rogers (32, right tackle with Ottawa) and Sukh Chungh (26, missed just three starts in four years with Winnipeg) and defensive back Delvin Breaux (29, top shutdown defender with Hamilton) also are top free agents. O'Day said fit is as important as talent when deciding which free agents to pursue. "It's a situation where you have to choose them and they have to choose you,'' he said. "Ultimately it's a two-way street. Traditionally, Popp hasn't been overly active in free agency. Like O'Day, he says fit is always important when looking to add talent. "Every situation is different,'' he said. "I always listen to what people are looking for, listen to agents or players who want to change addresses. Smart move by Sutherland to open it up for teams to talk to Reilly. Hervey has said Reilly won't make it to free agency. If he decides who he's going to before Tuesday & it's not Edmonton, he's free to bid on another QB and spend big bucks elsewhere at the opening bell. Worst scenario is having to keep 700 big ones aside for a guy that may not end up there thus losing out on some big free agents. Looks a lot like he's going to BC. Our Riders likely have no hope. Mr Chris Jones left behind a 12 - 6 Saskatchewan Roughriders team. Let's see how the Jeremy O'Day regime improves that. Go’day will do fine, everyone likes him. Bring back carm. Anonymous #3, I was a huge fan of Jones but let's keep in mind he left behind a team that much like every other team in the CFL is loaded with potential free agents. Every team could look a lot different and it may not necessarily be the fault of Jeremy O'Day. Chris Jones left behind the most pathetic offense in the league, let's see how the Jeremy O'Day regime improves that. Correction - He left behind a 12-6 defence. Hey Roughriders, if you pony up $800.000. ** Bo will play for you. You got to be joking, are you talking Darian? Stampeders are a professional run football organization from top to bottom. What would they want with a less than mediocre lazy azz qb who took a signing bonus (theft????) from BB and didn't play a down of football and said he deserved it.